Do you find yourself doing the same thing over and over again? Do you open the same program, day after day? Are you visiting the same websites or checking your email so many times a day that you lose count? Do you type the same information so often that you could do it in your sleep? Then you need Perfect Hotkey. Perfect Hotkey is a powerful hotkey (keyboard shortcuts) manager for Windows. Perfect Hotkey lets you create custom hotkeys to do almost anything — hide programs and windows, shutdown, restart or logoff, insert canned messages, open unlimited amounts of websites, programs, games, files, folders, drives. All with your keyboard. As you get accustomed to using your PC, keyboard shortcuts become increasingly useful. They save a lot of time and improves performance. However, one has to practice using such default shortcuts to know them all. Instead of researching and memorizing the default Windows shortcuts, you can use Perfect Hotkey to specify keyboard letter, symbol and number combinations to achieve certain tasks. After using the application to create and use various shortcuts, here is my take. Perfect Hotkey gets it right from the installation process. The steps are not only easy to follow but also the small-sized installation file will ensure you are through with the process in a couple of minutes. It is worth noting that my installation copy had a slight conflict with an existing keyboard shortcut on Windows 10. That is, the Windows key plus letter A. After changing this keyboard combination for the canned messages, the rest of the operation was smooth. After installing Perfect Hotkey, that is all that it takes to start using it. The application works smoothly with Windows and you can use the existing hotkeys right away. 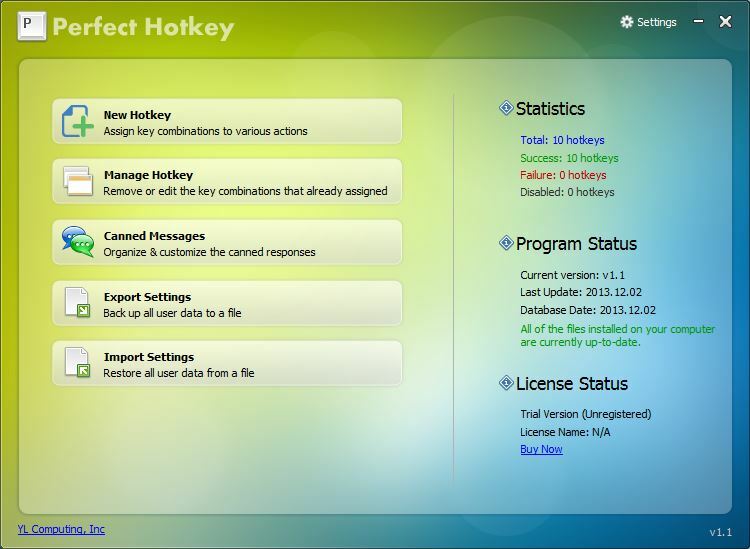 At the same time, the Manage Hotkey option allows you to delete, edit or add new hotkeys. Any added hotkey starts working without the need to restart the application. Since Perfect Hotkey allows you to add hotkeys that you can easily remember, the process of adding them may take long. After weeks of adding your hotkeys during your regular computer use, starting all over could prove cumbersome. Thankfully, the application allows you to export and import your data in case of a fresh installation. Canned messages come in handy when you regularly send the same replies to messages. Under Canned Messages, go ahead and create, edit, or add your custom messages. You can specify your preferred hotkey for Canned Messages like in my case whereby the program’s hotkey conflicted with Windows 10 Action Center shortcut. From one point of view, Perfect Hotkey’s ability to override default Windows hotkeys could be a good thing. However, it would have been good if the program warns you before you proceed to saving a hotkey that conflicts with your system’s keyboard shortcut. For instance, the program allowed me to add Ctrl plus A with the action to maximize the current window whereby the same keyboard combination usually highlights all the content on a webpage or word editor. This shortcoming also affects other Windows applications that let you specify their individual hotkeys. Perfect Hotkey is a nice piece of software that reasonably manages to let you take control of hotkeys on your system. Apart from the highlighted shortcoming, the application works smoothly without affecting the way you are accustomed to you keyboard shortcuts. It is worth trying out. Perfect Hotkey is an incredibly powerful application that lets you create hotkeys and assign them to almost every action that you can perform on your computer. From key combinations for launching your most used applications to shutting down the current window, this program will practically save you lots of time. Perfect Hotkey contains absolutely no clutter on the user interface. Everything you need to do with this software (except license registration which is hidden on the system tray) is clearly indicated on the homepage. The program is easy to use even for those who aren’t familiar with it. Also, the help feature is functional and will definitely come in handy if you get stuck. Windows itself comes with essential hotkeys, most of which many people don’t use. Perfect Hotkey not only allows you to use the pre-loaded Windows shortcuts, but also allows you to create hotkeys using different key combinations. You can assign hotkeys to native windows functions as well as to normal programs. A hotkey becomes effective immediately you create it. Also, you can edit and delete it. If you have a repetitive task, for example one that involves copying and pasting, you can used the canned messages feature to automate it. This enables you to perform recurring tasks with speed, precision, and less effort. Perfect Hotkey allows you to create and manage canned messages for any program. You can create a backup of your hotkeys and also import hotkeys from a compatible file. If you’d like a certain key combination to cease working for some time, simply head to the manage section and uncheck the green tick next to that function. Check and click okay for it to resume working. One thing that this software really lacks is the ability to work with a mouse. Using a mouse on a normal OS requires a lot of motion and hotkeys would have gone a long way to increase efficiency. You won’t customize this software to your liking since the settings page contains only the language and start up option. You’ll just have to keep up with the blend of green and blue colors on the user interface. Perfect Hotkey is a nice software that makes hotkeys cool again. It is definitely a great free download.